Tara Frantz and Ashley Bergman are best friends and cousins who are practically inseparable — even when donating blood. Their first time giving blood was at a mobile drive that came to their college in 2002. Because their family has many regular donors, it was an easy decision for the two of them to become consistent givers as well. They had a group of friends they would take to donate regularly. One time, they even went to the donation center for a birthday celebration. 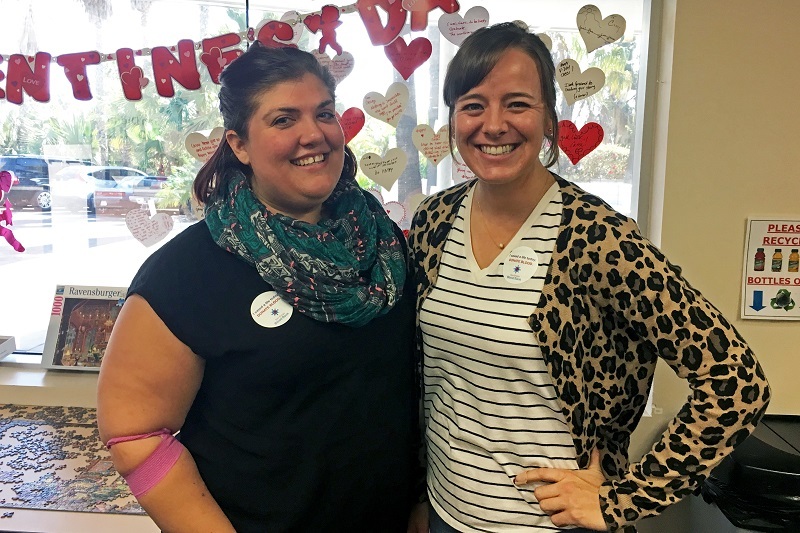 Now, both teachers in San Diego, Tara and Ashley continue the tradition they started together years ago by coming in to the San Diego Blood Bank to give. Ashley’s blood type is rare, so she understands the importance of people like her coming in to donate because she just might be a match with someone in need. Tara’s blood type is O-, or the universal donor, which can be given to any patient in need no matter their blood type. Both cousins enjoy traveling, anything outdoors here in San Diego, especially going to the beach, and teaching. For their next adventure, they’re planning a trip to Nashville to experience the Music City for the first time.